The global actions at the top of every discussion’s grading page allows instructors to perform tasks and apply them to many students with a single click. Students will then see your comments and scores in discussions AND in the gradebook, if you had checked “Send to gradebook” when you released the scores. You can release comments and scores as you grade in context, or you can bulk release scores from this view by clicking on “Release Evaluated Posts.” The software looks for posts that have scores and releases them to students. Additionally, you can release scores and comments selectively from the grading view by checking the boxes on the Released column on the rows of the students’ work that you want to release, and clicking on “Update”. 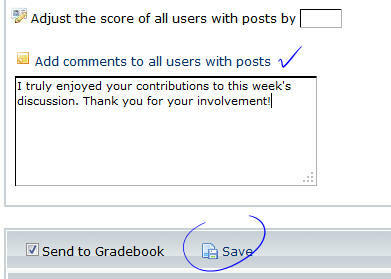 This feature allows you to adjust the scores of all students who have posted in a topic, forum, or category. 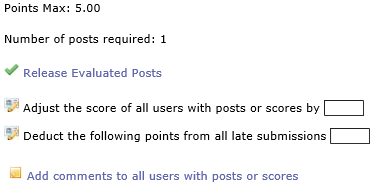 Also, if students have not posted topics or replies but were awarded points by instructors, they will also receive the global score adjustment. Negative point adjustments are allowed, as well. This feature allows instructors to deduct points to all students with ‘late’ submissions. Just enter the value that Etudes should subtract from all late submissions and click on Save. Ideally, this function should be applied after a discussion assignment is closed and has been graded. Ability to “add comments to all users with posts.” This feature allows instructors to append comments to all students who have posted in a topic or forum. Also, if students have not posted topics or replies but were awarded points by instructors, they will also receive the global comments. This function is only available in the global options of the grading view only if the discussion is closed. This feature allows instructors to award 0s to non-submitters with a single click. The feature knows if a discussion is NOT closed for specific students (due to extensions with special access) and it does not add 0s to them. When a 0 is awarded with this function, the submission is also marked as released. The scores are sent to the gradebook, is specified in the settings.